Bosch are the latest manufacturer to bring out a multi-tool â€“ if the big boys are bringing a new model out, then we'll check it out! Out of the box, the tool has a nice, slim grip and the usual Bosch feel of quality, but does it work? The first thing you notice, and the thing that marks the Bosch out from the opposition, is fitting your blade to the tool. Bosch has come up with an SDS system that allows you to change the blade with the pull of a lever. The arbor is split in two and closes when you pull the lever. Then simply position your blade and reclose the lever, and the arbor opens up slightly, locking the blade in place into the 12 securing lugs - which, incidentally, is a standard fitting which allows you to use other compatible blades. This fixing method is quick, brilliant and for someone who will make good use of using many different blades, this is the must-have multi-tool. In short, it's a brilliant innovation. As for using the tool, the 300W motor provides plenty of grunt, and I found cutting oak (Quercus robur) and chipboard worktops a doddle. There's also a speed pre-selection, for the different types of attachments you would use, from sanding to cutting. Bosch also have a system they call Constant Electronic which, they say, keeps the oscillations constant under load - and this function seemed to work very well. There are also nice touches like a cable ball to stop the wire fraying. This multi-tool is the best of the bunch so far. It's powerful, flexible, well thought out, and the quick change system is just brilliant. Overall, I am very impressed. As woodturners we often have tools in our workshop that we use around the home and garden but overlook the potential for use in our turnings. I use random orbital sanders regularly for turning but only know of a few other people who do so. 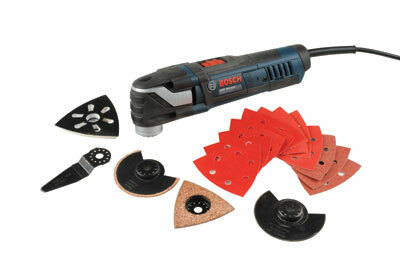 It is much like this Bosch GOP 300 SCE multi-cutter. With the accessories one can obtain for it, it can be used when tiling, shop fitting, cutting boards for flooring, sanding, scraping and so much more. Some of these functions and cutters can be ideal for the turner. The delta sanding plate is great for certain jobs; you can fit interface pads on this too - not supplied by Bosch - for softer sanding applications and so you have a moulded sanding face to work with. 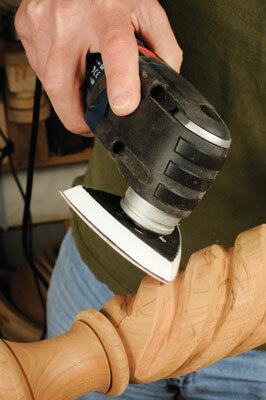 The cutters can be used to sculpt, carve, cut and shape work as well. I have, at times, found it easier to use these on some jobs than using rotary carvers or other tools. The quick release system is great and it is so simple to use. Not cheap, but a very useful bit of kit around the home, for tradesmen and, as I am finding, it has many uses for me as a turner.